Booster hose has long been the preferred first attack fire fighting equipment option for instant water supply, while larger volume hoses are being set up and charged. The combination of a booster hose and reel has proven to be the fastest, most reliable way to dispense and rewind fire hose. 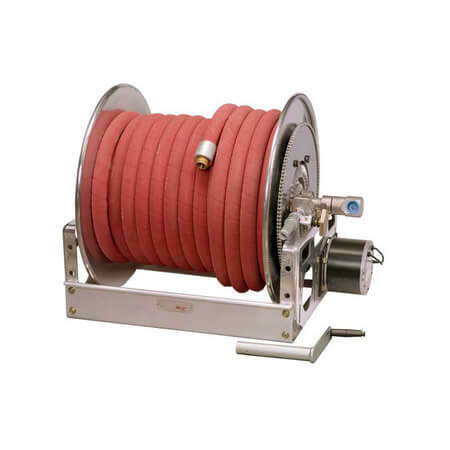 The Super Booster reel is a dependable, rugged reel that has set the standard for fire service reels for more than 50 years. The super booster weighs up to 50 percent less than standard booster reels and features an all-aluminum frame and drum and polished aluminum discs. Standard features include a gear-driven crank rewind and a pinion brake. Also supplied on the unit is a 1" 90-degree ball bearing swivel joint standard inlet with 1" female NPT threads. The standard outlet is a 1" male NST threads. Hannay booster reels operate at pressures up to 1000 psi.